Wingspan 13 to19 mm. 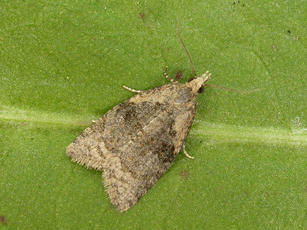 A fairly broad-winged Tortrix moth. The females are less well-marked than the males, which have paler markings on the base of the forewing, and a buff-coloured head. Woodland and well wooded areas. The main flight period is during May and June when the moths can be seen flying at dusk. The larvae feed on a range of woodland plants, including Alder, Rowan and Bilberry. Fairly common throughout much of the British Isles. In the Butterfly Conservation’s Microlepidoptera Report 2011 this species was classified as common.